SOME VOICES, the coolest non-audition pop choir in London, started in 2010 with just seven choir members meeting up to sing and socialise. Now with over 800 members meeting in12 rehearsal venues across London, Some Voices has grown and developed a signature style of performing original arrangements of popular songs that range from Bowie to Bjork, from Stevie Wonder to Stevie Nicks, from Folk to Hip Hop, and everything in between - all with a Some Voices twist. We know that music brings people together. With proven benefits for mood and well being, we believe singing in unity creates a unique sound and experience that can resonates for members and audiences alike - long after a rehearsal or show has finished. There’s no audition required to join our high energy rehearsals, so our choirs bring all kinds of voices together, regardless of previous experience or ability - every voice is welcome. Find your local choir and join us. We are rolling out the red carpet to bring a whole lot of Hollywood grandeur to South West London’s hoppin’ historical party venue, The Grand. Hollywood Hits celebrates some of the most loved soundtracks and iconic moments in film performed live by a 300 strong choir and band. Get En Vogue, seal it with a kiss and don't forget to mmm bop your way through the night - welcome to the Nineties. 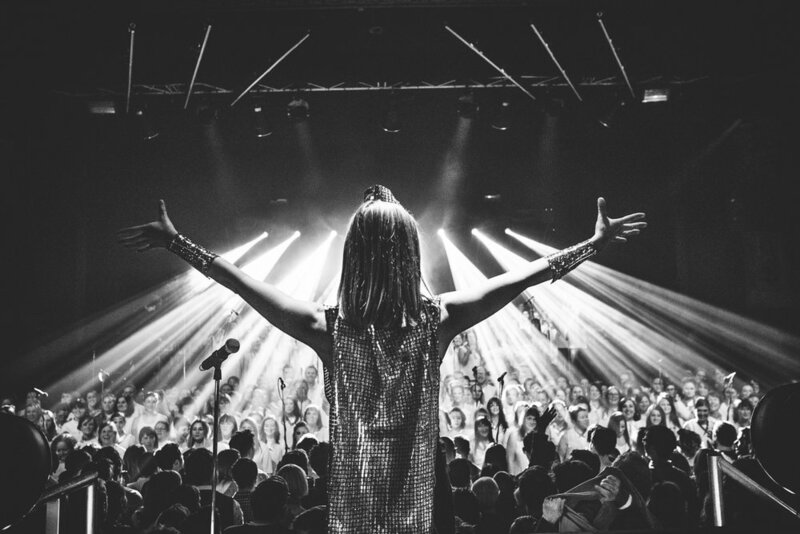 Joining an incredible line-up including CHAKA KHAN, ALL SAINTS & BANANARAMA, Some Voices choir return to the festival in 2019 with a 100 singers for a non-stop high energy performance of disco favourites and dance bangers. Some Voices will be joining the stellar line-up @brixtondiscofestival kicking off 27th April in the heart of Brixton. Christmas choir, Flash-mobs, private parties,weddings, corporate events or sing-a-long events - we have an extensive and varied repertoire of music and work closely with our clients to make sure we give you the perfect pitch, whatever your event may be. 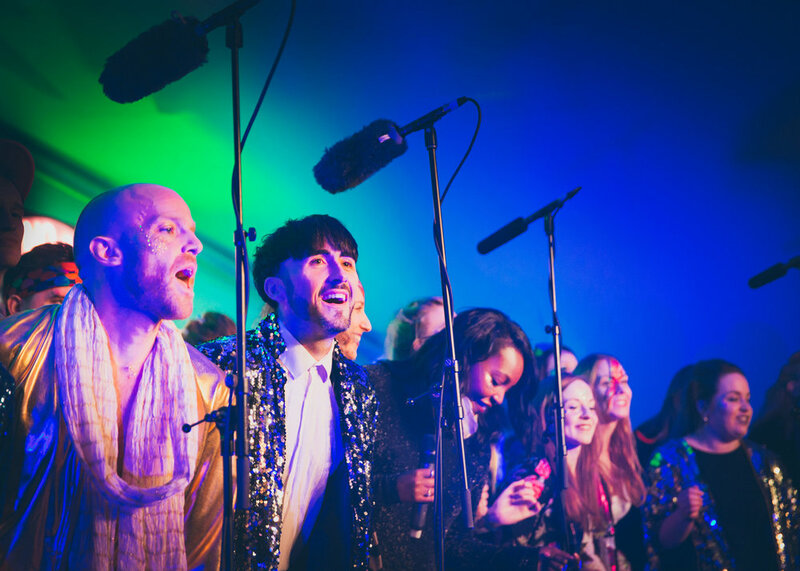 Some Voices work with professional singers, artists and musicians to deliver bespoke performances in work places or at events, parties and festivals. We have an extensive and varied repertoire of music from Bowie to Tina, Radiohead to Pulp. Do you want to brush up your skills but can't commit to joining a full term with Some Voices? We' have launched a series of singing workshops for both current members and non-members to take part in on a pay as you sing basis. Our first workshop on the 11th May at The Grand, will be led by professional singing coach Jo Thompson whose clients include artists such as James Bay; James Blake, Ms Dynamite; George Ezra; and Jessie Ware as well as TV and stage personalities Brian Blessed; Michael Caine; Fearne Cotton; and David Tennant.